Two astrophysicists at NASA's Goddard Space Flight Center in Greenbelt, Md., Nikolai Shaposhnikov and Lev Titarchuk, have successfully tested a new method for determining the masses of black holes. Cygnus X-1 was the first compelling black hole candidate to emerge in the early 1970s. The system consists of a blue supergiant star and a massive but invisible companion. Optical observations of the star's wobble have suggested that the invisible object is a black hole containing about 10 solar masses. "This agreement gives us a lot of confidence that our method works," says Shaposhnikov. "Our method can determine a black hole's mass when alternative techniques fail," adds Titarchuk, who is also a research professor at George Mason University, Arlington, Va., also works at the Naval Research Laboratory, Washington. Shaposhnikov works for the Universities Space Research Association, a part of the Center for Research and Exploration in Space Science and Technology within NASA Goddard. Working independently, Tod Strohmayer and Richard Mushotzky of Goddard and four colleagues used Titarchuk's technique to estimate that an ultra-luminous X-ray source in the small, nearby galaxy NGC 5408 harbors a black hole with a mass of about 2,000 suns. Titarchuk's method takes advantage of a relationship between a black hole and the surrounding disk of matter spiraling into it, called an accretion disk. 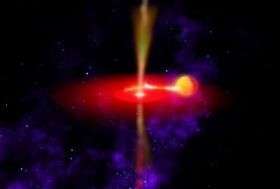 Gas orbiting in these disks eventually falls into the black hole. When a black hole's accretion rate increases to a high level, material piles up near the black hole in a hot region that Titarchuk likens to a traffic jam. Titarchuk has shown that the distance from the black hole where this congestion occurs is on a direct scale with the mass of the black hole. The more massive the black hole, the farther this congestion occurs from the black hole, and the longer the orbital period. In his model, hot gas piling up in the congestion region is linked to observations of X-ray intensity variations that repeat on a nearly but not perfectly periodic basis. These quasi-periodic oscillations (QPOs) are observed in many black hole systems. The QPOs are accompanied by simple, predictable changes in the system's spectrum as the surrounding gas heats and cools in response to the changing accretion rate. Precise timing observations from NASA's Rossi X-ray Timing Explorer (RXTE) satellite have shown a tight relationship between the frequency of QPOs and the spectrum, telling astronomers how efficiently the black hole is producing X-ray radiation. Using the European Space Agency's XMM-Newton X-ray observatory, Strohmayer, Mushotzky, and their colleagues detected two QPOs in NGC 5408 X-1. This object is the brightest X-ray source in theirregular galaxy NGC 5408, 16 million light-years from Earth in the constellation Centaurus. The QPO frequencies, as well as the luminosity and spectral characteristics of the source, implies that it is powered by an intermediate-mass black hole. "We had two other ways of estimating the mass of the black hole, and all three methods agree within a factor of two," says Mushotzky. "We don't have proof this is an intermediate-mass black hole, but the preponderance of evidence suggests that it is." The existence of IMBHs remains controversial because there is no widely accepted mechanism for how they could form. One of the study's co-authors, Roberto Soria of the Harvard-Smithsonian Center for Astrophysics, Cambridge, Mass. thinks the black hole's mass could be closer to 100 suns.